In the immediate vicinity of the venue there are a few hotels that are within a few short walk (prices in the photo are exemplary). 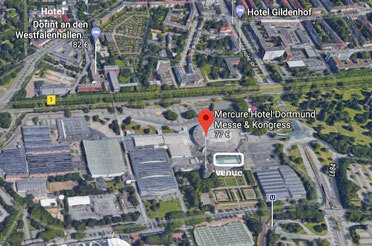 The Mercure Hotel "Dortmund Messe & Congress Westfalen-hallen" is holding a contingent for the RRWC. The hotel is directly connected to the lecture halls and offers the shortest routes. Of course the Mercure Hotel is, like almost all hotels in Dortmund, is also prepared for our traveling four-legged friends. Online booking will be available from end of April, 29th 2019 on. More accommodations in and around Dortmund can also be found under: www.booking.com or through offers by AirBnB. Additionally, we are also offering participants the possibility through arranging private accommodations with breeders and breed enthusiasts in the surrounding area. 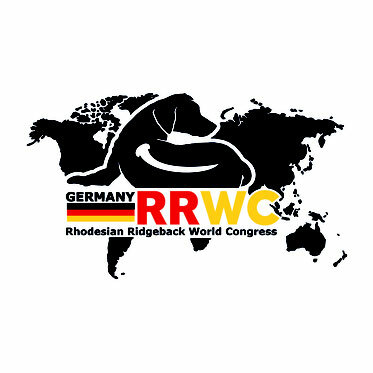 If you are interested in offering accommodation during the RRWC or if you would like to stay in private accommodation yourself, please do not hesitate to contact us. Dortmund Airport has direct connections to and from many European cities. Distance to the Westphalia-Halls Dortmund: 12 km (7 ½ miles). Distance to the Westphalia-Halls Dortmund: 62 km (38 ½ miles). From almost all major cities to the main train station Dortmund. From the main train station Dortmund take the subway line U 45 direction “Westfalenhallen”. Using public transportation, take the subway line U 45 (direction “Westfalenhallen”). You can easily get from the “Dortmunder” Central station within 10 minutes to the stop "Westfalenhallen". From the city center of Dortmund (subway stations: “Reinoldikirche” or “Stadtgarten”) the U 46 brings you (in direction “Westfalenhallen”) in about 5 minutes, It also has a stop "Westfalenhallen". Alternatively, take the U 42 (direction “Hombruch”) to the stop "Theodor-Fliedner-Heim ". From there it is a short walk to the exhibition center. The way to the “Westfalenhallen” is posted at all the above mentioned stops. All stops are handicapped friendly. Signs will guide your way on the freeways. If you use a navigation device, please enter "Rheinlanddamm 200" as your destination address, or the special destination "Westfalenhallen". From the destination address, please follow the signs closely. The entrance “Messe West” has its own access sign from the west. There are enough parking spaces in the immediate vicinity for around about 8,800 cars and buses.